When you've finalized your design, the last step before sending it off to the fab house is to generate gerber files. Gerber files are kind of a "universal language" for PCB designs. 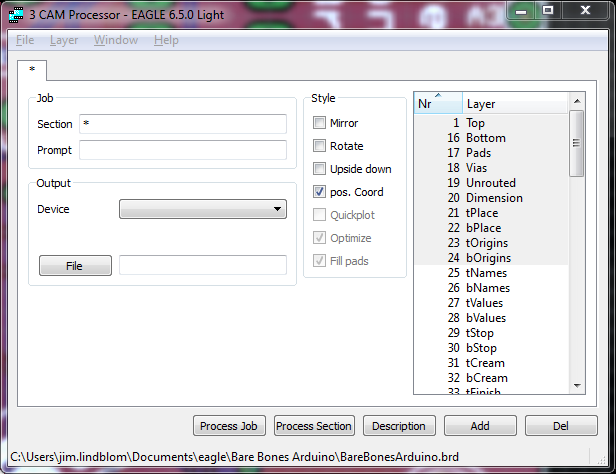 EAGLE is far from the only PCB CAD software out there, and its design files are nothing like those of Orcad or Altium. Fab houses can't possibly support every piece of software out there, so we send them the gerber files instead. Gerber files -- note the plurality -- each describe single layers of the PCB. One gerber might describe the silkscreen, while another defines where the top copper is. In all, we'll generate seven gerber files to send to the fab house. Before we get too much further, you'll need to download another definition file: SparkFun's CAM file. From here, go to the File menu, then go Open > Job.... In the file browser that opens, select the sfe-gerb274x.cam file that you just downloaded. Now the CAM processor window should have a series of tabs: "Top Copper", "Bottom Copper", "Top Silkscreen", etc. Each of these tabs define how to create one of the gerber files. Now all you have to do is click Process Job. If you haven't saved recently, it'll prompt you to. The gerber generation process should be pretty quick. Once it's run its course, have a look in your project directory, which should have loads of new files in it. In addition to the board (BRD) and schematic (SCH) files, there should now be a .dri, .GBL, .GBO, .GBS, .GML, .gpi, .GTO, .GTP, .GTS, and a .TXT. Meet the Gerbers! There are PCB manufacturers all over the world, so you shouldn't have any trouble finding one. OSH Park is pretty great for low-volume, high-quality PCBs (plus, they're purple!). Advanced Circuits is awesomely fast. Gold Phoenix is cheap. We could go on and on, but Ladyada has a great list over on her website. Before they fabricate the board, the fab house will usually run a quick design for manufacturability (DFM) check, and let you know if something on your design will cause in a problem. The process of sending gerber files varies by fab house. 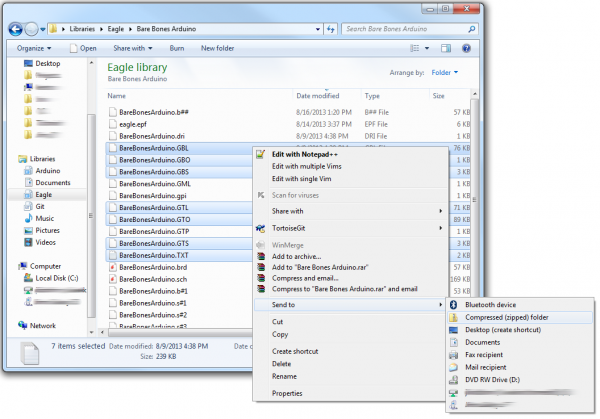 Most will ask you to send them a zipped folder of select files. Which gerber files? Check with your fab house again (e.g. Advanced Circuits and OSH Park's guidelines), but usually you want to send them GTL, GBL, GTS, GBS, GTO, GBO and the TXT files. The GTP file isn't necessary for the PCB fabrication, but (if your design had SMD parts) it can be used to create a stencil. So zip those gerbers up. Play the waiting game. And get ready to assemble your very own PCB!